Whatever tax bracket you fall into determines the percentage of taxes you must pay based on your income, but that’s not the same as the percentage of taxes taken out of your paycheck. Other income, as well as deductions and credits, may go into figuring how much you owe the IRS annually. The amount of federal tax taken out of your paycheck is influenced by your current gross income level and the specific allowances you have claimed on your W-4. Your pay stub will show the amount of federal income tax withheld, based on the W-4 form, also known as the Employee’s Allowance Withholding Certificate, that you submitted to your employer and the employer’s payroll tax calculator. 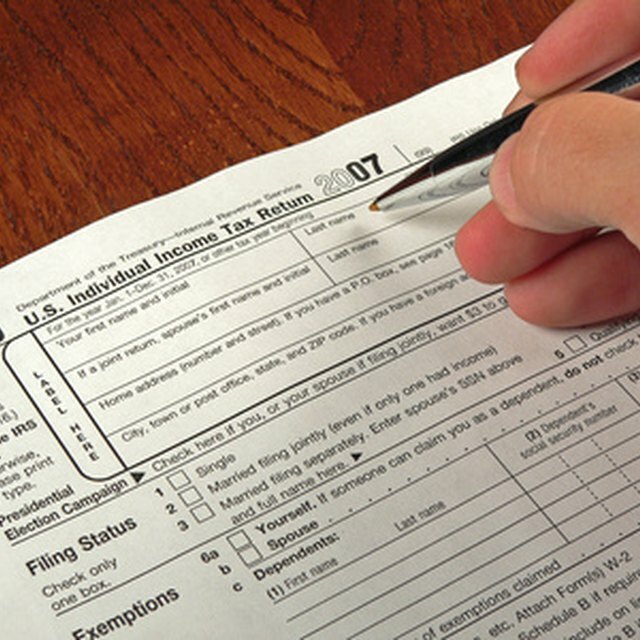 In addition to income taxes, you'll notice some other taxes taken out of your paycheck. Your Federal Insurance Contribution Act (FICA) taxes consist of Social Security and Medicare. If you are an employee, your employer pays half of your Social Security taxes, or 6.2 percent, and you pay the other half out of your gross wages. Self-employed people must pay the entire 12.4 percent in Social Security taxes. There is a cap on Social Security taxes, known as the wage base, which changes each year. Medicare tax is 1.45 percent of your gross wages, and there is no income limit. However, once a person’s wages pass $200,000 for the year, the employer must deduct an additional 0.9 percent in Medicare taxes. Federal withholding taxes are not the only taxes withheld from paychecks. For example, if you are a California resident, expect to find California income taxes deducted from your paycheck. The amount of state tax witheld from your paychecks depends on your state’s tax rates. The IRS offers a withholding calculator so taxpayers can ensure they have the correct amount of tax taken out of their paychecks. If you have too much tax taken out of your paycheck, you will receive a refund, but in the meantime, you’re giving the government an interest-free loan. If you have too little tax withheld, you’ll end up having to send the IRS a check when you file your taxes and for many people, that’s a true hardship. How Much Do They Take out in Taxes if You Claim Two Exemptions? The Tax Cuts and Jobs Act, signed into law on Dec. 22, 2017, overhauls the U.S. tax code. Many people will find the percentage of taxes taken out of their paycheck to be lower, as they may fall into a lower tax bracket as per the new law. For 2018, the wage base for Social Security taxes is $128,400. The IRS recommends that taxpayers review their W-4 forms and adjust their withholding accordingly. Under the new law, the federal income tax brackets are 10 percent, 12 percent, 22 percent, 24 percent, 32 percent, 35 percent and 37 percent. The federal income tax brackets for 2017 are 10 percent, 15 percent, 25 percent, 28 percent, 33 percent, 35 percent and 39.6 percent. For 2017, the wage base for Social Security taxes is $128,200.